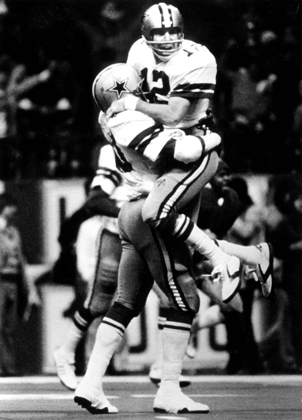 Staubach became a legend after missing the first four seasons of his career to the Naval Academy, leading the Cowboy’s to nine-straight winning seasons and two Super Bowl championships. Along the way, he became the first player to win the Heisman Trophy and a Super Bowl MVP and the man who coined the phrase “Hail Mary” with one legendary bomb in a 1975 playoff game vs. the Vikings. Of course, Staubach also made the Cowboys America’s team, meaning he’s the reason you can’t go anywhere in the country without bumping into their crazy fans. Try to forgive him. 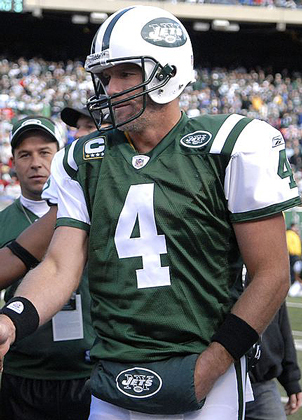 He loses points for overexposure—not to mention overuse of a camera phone—but there’s no denying that Favre was one of the greats. The three-time MVP and 11-time Pro Bowler was a tough, gritty QB beloved by teammates and obsessed over by the media. And thanks in part to his 297 consecutive starts, Favre became the only QB in history to top 70,000 passing yards and 500 touchdowns. Now just pray that those retirement papers he filed on January 17 are binding. 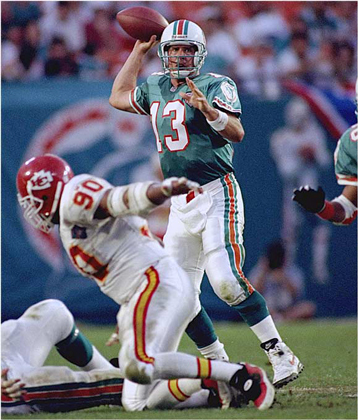 Unfortunately, Marino loses points for never winning the big one and putting up an uninspiring 8-10 career record in the postseason with a QB rating that dipped to 77.1 in the playoffs. Still, No. 13 threw for 61,361 yards and 420 touchdowns in his NFL career, putting up numbers unheard of in the ‘80s, including a legendary sophomore season that saw him collect 5,084 yards and 48 touchdowns. Plus, he did one hell of a job playing a kidnapping victim in Ace Venture Pet Detective. It’s tempting to think of Terry Bradshaw as the cackling talking head on Fox NFL Sunday, a Southern fried Frankenstein monster who shouldn’t be taken seriously. And you’re right. 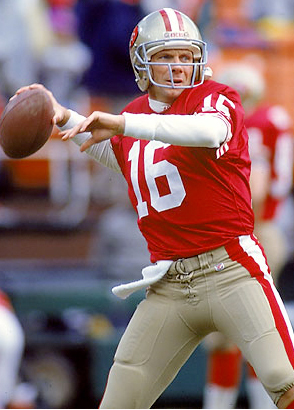 But he was also a damn fine quarterback. 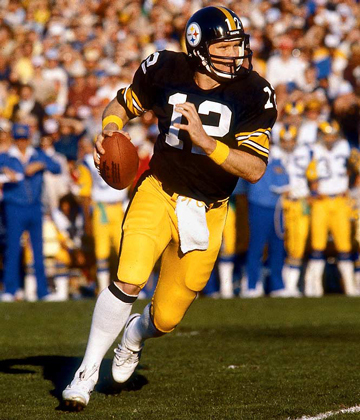 With an arm that was always powerful and often erratic, Bradshaw stepped it up when it counted: his 70.9 regular season QB rating improved to 83.0 in the playoffs and 111.2 in the Super Bowl. No wonder he became the first QB to win three (and then four) championships. He’s like Michael Vick—but if Vick never went to prison and was the great-great-great-grandson of Brigham Young. This lefty endured two seasons on the USFL’s Los Angeles Express (his contract, paid in an annuity, still runs until 2027), a 3-16 record as a starter on the Bucs, and four years backing up Joe Montana to become a legend. 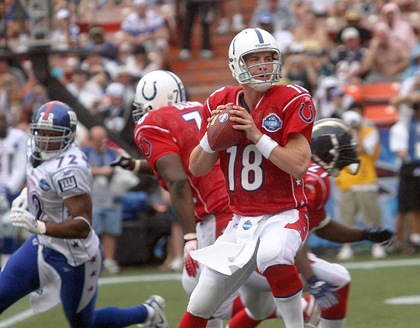 Young made the Pro Bowl in all seven of his years as a starter, winning two MVPs and leading the league in completion percentage five times. But he’s most remembered for his Super Bowl performance in 1994: 24-for-36, 325 yards, six touchdowns, 49 rushing yards. It might have been the greatest game ever played on the big stage. Though he’s rehabbing from off-season surgery that could put his future effectiveness in jeopardy, the one-time Super Bowl champ has already earned a spot on the list. Ever since he set five records as a rookie—including most TD passes (26) and yards (3,739)—the king of the hurry-up offense has been breaking new ground in the game. Owner of four MVPs, the most in league history, Manning has also amassed the most 4,000-yard passing seasons. Even more impressively, he actually did a halfway decent job hosting Saturday Night Live. Things started off inauspiciously for Elway when he threatened to play baseball for the Yankees unless the Colts traded him. Trade him they did, and as a Bronco Elway would prove to be a durable, mobile playmaker with a cannon for an arm and pinpoint accuracy. 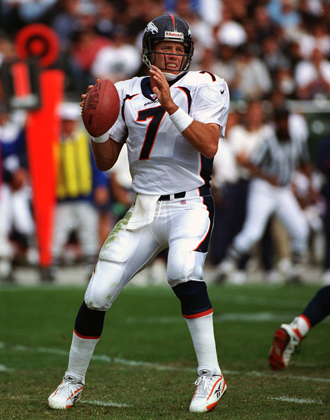 Elway threw for 51,475 yards and 300 TDs in his career, plus piled up 3,407 rushing yards for good measure, and bounced back from losing in his first three Super Bowl appearances to win his last two. 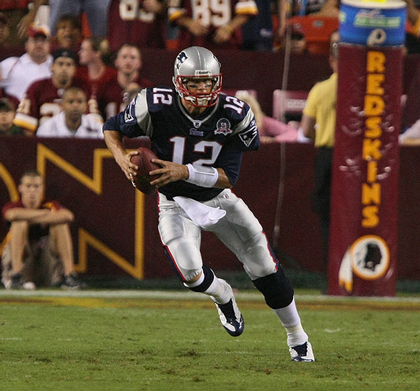 He walked off into the sunset after that last one, becoming the oldest quarterback (38) ever to win the Super Bowl. He may be the one quarterback from the good old days who could thrive in today’s game. In fact, his 34 touchdown passes in 1959 would have been good for fourth place last season. It makes sense since it was Johnny U who changed how the position was played. 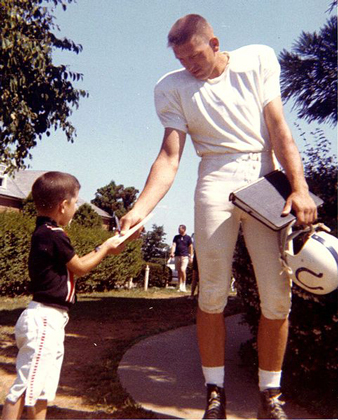 Unitas introduced the two-minute offense, becoming the first QB to have a 30-TD season or surpass 40,000 passing yards in his career, and his performance in the 1950 championship game, dubbed the “Greatest Game Ever Played,” put professional football on the map. To think he was cut by his hometown Steelers in his rookie season and was playing on a semipro team for $6/game before Weeb Ewbank plucked him from obscurity. You may hate him for hairstyle or his supermodel wife, but Brady’s an all-time great. The 199th pick in the 2000 NFL Draft has played with a chip on his shoulder ever since a rib shot dropped Drew Bledsoe and sent Brady into the starting lineup. He’s the owner of the longest win streak in NFL history (21), helmed the only undefeated team in the 16-game era, had the most wins in his first 100 starts (76), threw for 4,806 yards and a record 50 touchdowns in 2007, has never had a losing season and has won three Super Bowls. Not too shabby. Known for being cool under pressure, Montana threw for 40,551 yards and 273 touchdowns in his storied career, making the Pro Bowl eight times and winning back-to-back MVPs in 1989 and 1990. But he really separates himself from the pack with his postseason play. 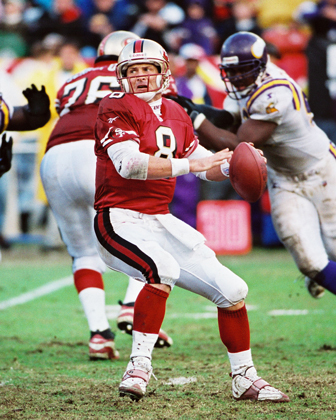 Montana began earning a reputation with a game-winning, 92-yard drive in Super Bowl XXIII and would proceed to go four-for-four in the big game (including three MVPs) with a QB rating of 127.8. Now, let’s just agree those two years with the Chiefs never happened, OK?